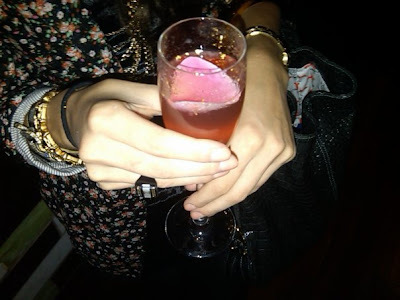 What started off as an intimate gathering of bloggers to watch the Victoria's Secret Fashion Show at Hotel Giraffe, turned into an epic night of celeb spotting, model mayhem, and lots and lots of all out fun. 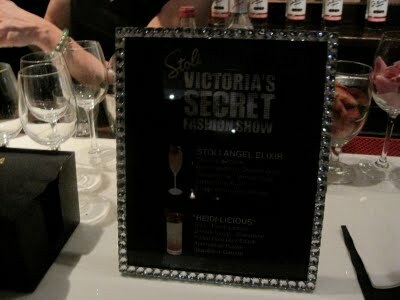 I was live status updating and tweeting during the whole show and night while sipping some Stoli Angel Elixers. 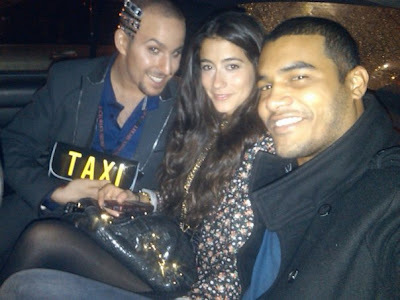 Celeb blogger Micah Jesse stole all of the attention away from the models on the TVs with his blinged out rhinestone studded head and flashing taxi clutch. Immediately had to document this in a picture. He is head to toe A/X and the taxi clutch is 2enlight10 by Regine Basha. Click here for more info! Let's just say we had zero problems getting cabs last night with a flashing taxi clutch and sparkly rhinestones shining like a beacon on the side of the street guiding taxis our way. Brilliant. After the show, Micah, myself, and model/actor and Red Carpet Runway host Jaizen Homiller headed out to the after party at M2. The entrance to M2 was lined with a fuzzy pink carpet and we all walked it immediately after this girl below. Which left me extremely depressed until Jaizen so kindly told a tv crew during an interview that the definition of a bombshell was me... naaww, sweet Jai. Not true, but sweet. Micah's shiny beacon of a head led us straight into the VIP section where Micah's head caught the attention of Taboo from the Black Eyed Peas. He died for the rhinestone detail and I quite honestly wouldn't be surprised if they worked that look into their futuristic stage get-ups. You heard it here first. All the girls were there: Chanel Iman, Alessandra, Marissa Miller, Miranda Kerr (my fave), Sesilee... along with Harvey Weinstein, Alexander Wang, Fergie, Seth Myers... The list goes on. Tons of Herve Leger dresses floating around and when you see some of these girls in person, you just want to go home early, get tons of beauty rest, wake up, book a trainer and go get a spray tan. The show seemed a little bit shorter than previous years and the costumes and wings didn't seem quite as shocking. They are always beautiful though. The background sets were gorgeous and lended well to the outfits. They used some amazing over the knee boots with lingerie that were pretty impressive. And the Pink girls looked so cute in tons and tons of sequins and cute sweats that we all know and love paired with chunky wedges. One of my favorites, Adriana Lima, was absent from the show as she's busy having babies and was definitely missed. But the show never ever disappoints and the presence of some high fashion girls (Abbey Lee, Doutzen Kroes) on the runway was super fun. Set your Tivos for December 1st at 10pm on CBS! The production of the show once it airs is always amazing and captures interviews with the girls and backstage shots.